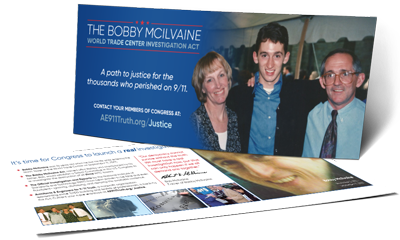 24" x 18" Lawn Sign – Show how real patriotism leads to 9/11 Truth this September 11th. Prints both sides. Our 24" x 18" yard sign shows both the freefall collapse of WTC 7 and the famous 3 light beam image while asking questions about each. This bumper sticker spreads awareness by asking, "What Happened to Building 7?" This 4" x 15" bumper sticker says "9/11: Explosive Evidence".